Designed for commercial use (I think), but works great in my house under the sink with a separate filtered drinking swan neck tap. Lasts about 6-7 months before needs changing for family of four. 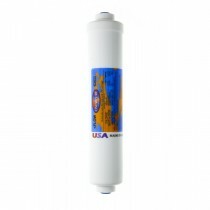 Great price for refrigerator inline water filter, simple installation. Worked as expected. When installing I made mistake, need to remove it which can be done by pressing on the blue ring to release the tubing, and then reinsert the tubing to re-install, no leaks. Very happy!! A filter that needs to be replaced once per year rather than the $40 filters that need replacing twice or even 4 times per year is a huge money savings. Piece of cake to install, simply shut the water off and cut the 1/4" poly pipe common for the installation kits. Place the water supply in the "In" end of the filter, place the out end over a bucket and turn the water on. Flush it until the water runs clear (instructions say 10 minutes, but about a minute was enough with my water flow.) Turn the water off, press the outflow tube into the "Out" end of the filter and you're done. Be sure to check for leaks, but it is really hard to mess this up. No need to buy extra fittings, just ensure that the 1/4" line is in good shape with no burrs and the lines slide right in. No leaks. This K2533JJ inline water filter can be used in different settings, the quick connect allow one to plug it in for refrigerator use for water or ice. 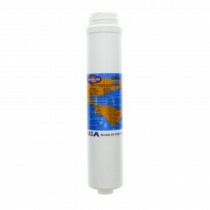 I use it as the final carbon filtration in my RO for drinking and aquarium use. 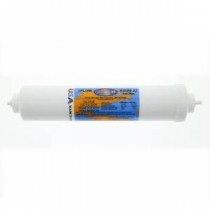 Glad I found it on Finerfilters website and at a good price compared to places supplying to fish enthusiasts.